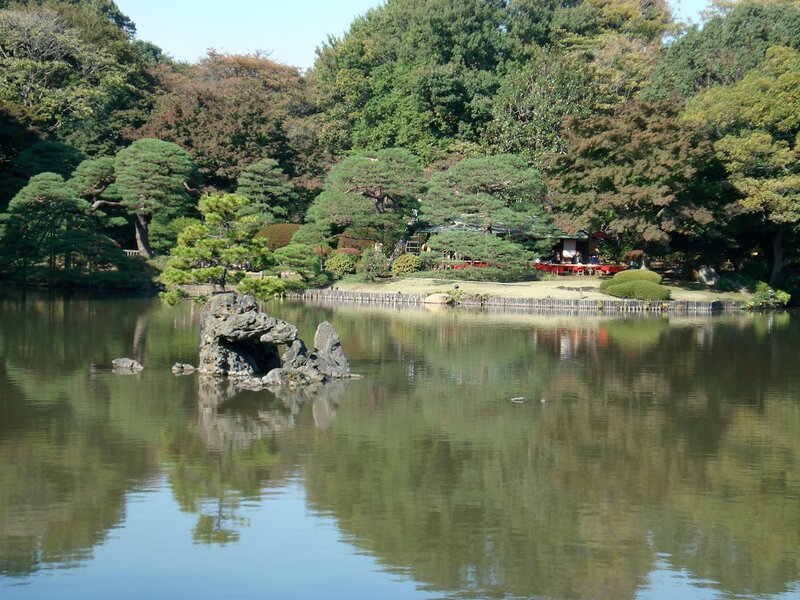 Rikugien is a large Japanese garden that was built in the 1702 by Yanagisawa Yoshiyasu for the Shogun, Tokugawa Tsunayoshi. The name pays tribute to the Chinese system of dividing poetry into six categories. This system influenced the development of Japanese waka poetry. 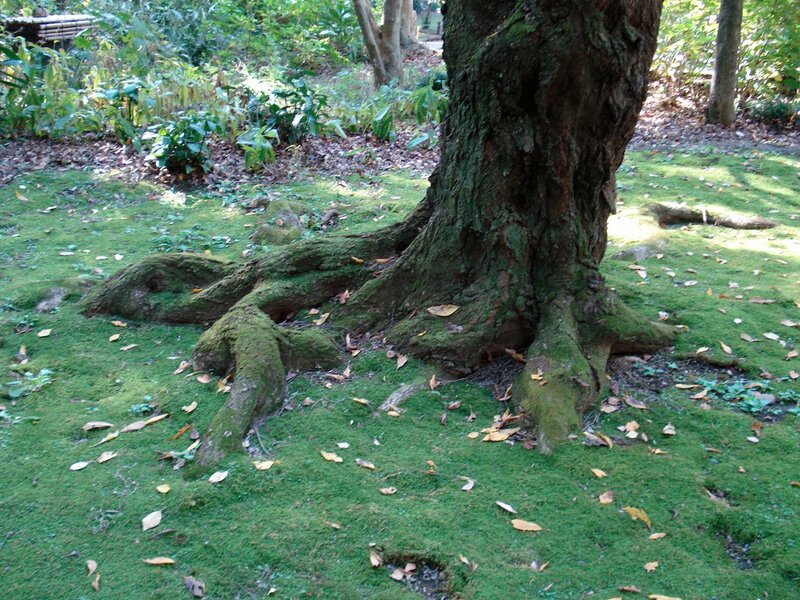 Famous waka poems were the source of much of the design of the garden's landscapes and features. 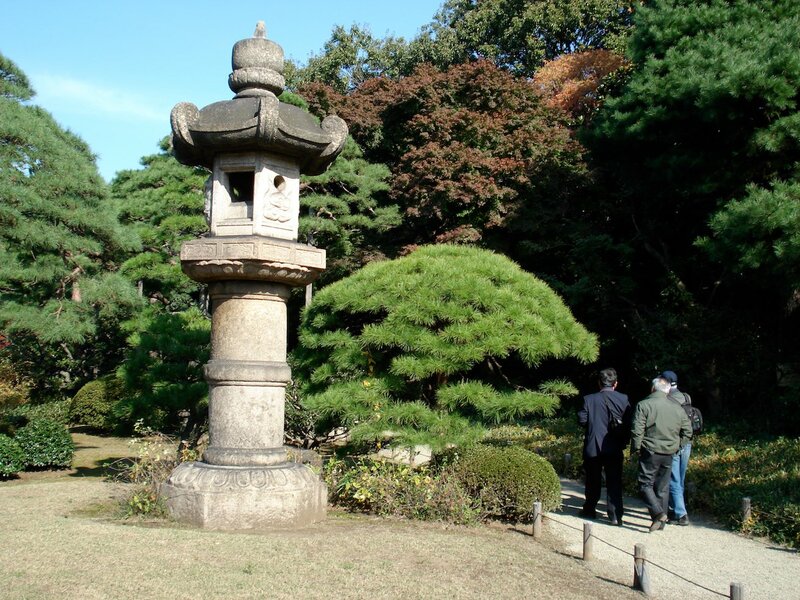 The gardens were donated by the Iwasaki family in 1938 (See also: Kyu-Iwasakitei Gardens) to the City of Tokyo. It was designated a special site of exceptional beauty and an important cultural asset in 1953. The front entrance of the park opens onto rolling and grassy hills in front of the large central pond. First, you walk past the large weeping cherry tree that is, of course, best viewed when the blossom are out in late March. The shoreline area opposite the entrance is called Deshio-no-minato. As you walk around the pond, numerous nice views of the pond are revealed. Some distinct views are separated by only a few meters but show another aspect of the scenery. 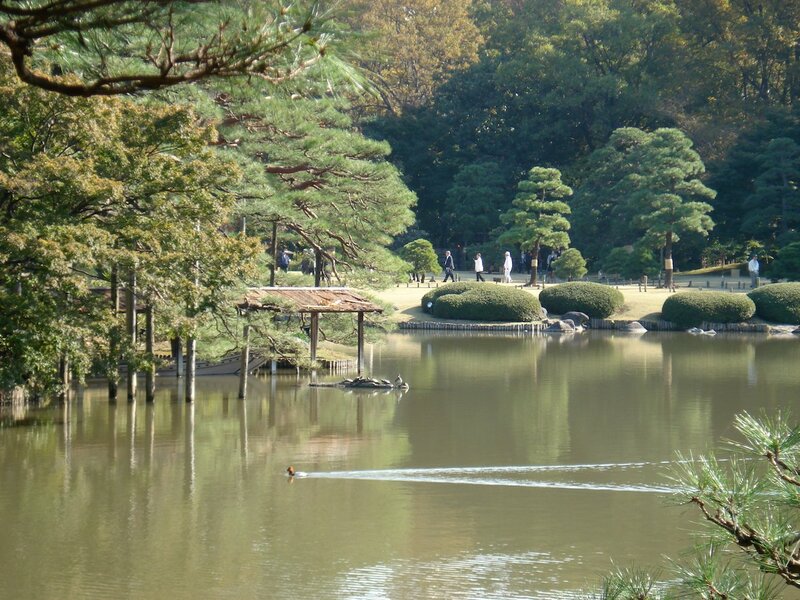 All paths in Rikugien pivot around the pond. The inner paths are more open, bright and sculpted and the outer paths go through woodland terrain. If you walk clockwise around the pond then you will first encounter the Takimi-no-chaya (Takimi Teahouse) in the forest and next to a small creek. 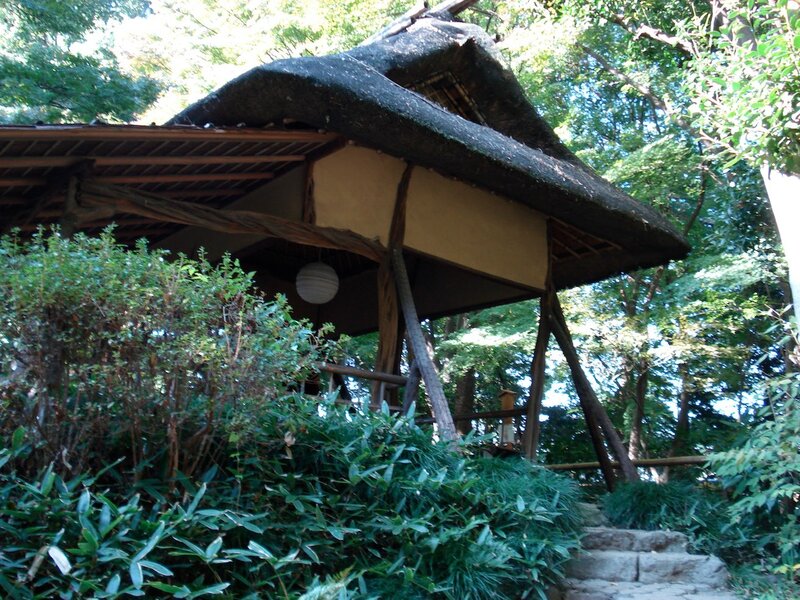 Next, the larger Fukiage-chaya (Fukiage Teahouse) overlooks the central pond on the north shore. Refreshments can be bought and enjoyed next to the water here. Tsutusuji-no-chaya to the north of Fukiage-chaya is perhaps the most modest but also the most dramatic of them all. It was built during the Meiji Period and its roof is supported by twisted old wood that absurdly holds up a roof that looks ready to crush it at any moment. In the northern corner is Fujishiro-toge. This path is named after a mountain pass in Wakayama Prefecture. 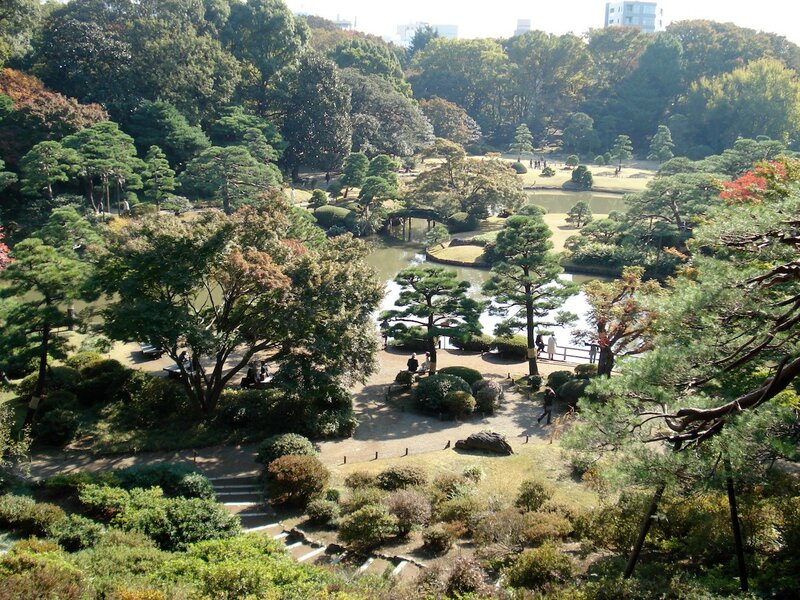 From the top, one can see the northern corner of Rikugien Gardens. While coming back, there are a number of dramatic bridges and a leaf viewing forest. 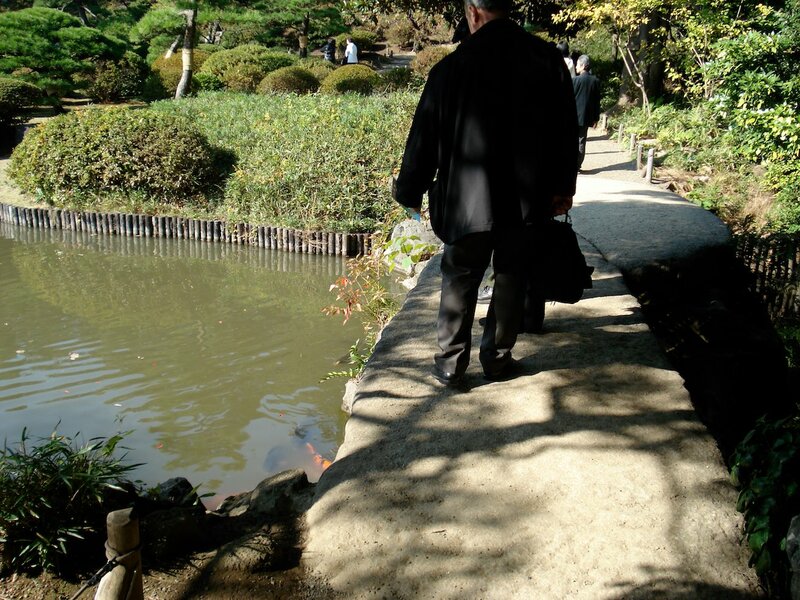 One of the bridges leads to the large island in the pond. However, the best is called Togetsukyo. It was inspired by a Waka poem about the moon moving across the sky as a crane cries in a nearby rice paddy. The bridge is made up of two large stone slabs that are laid parallel to each other. 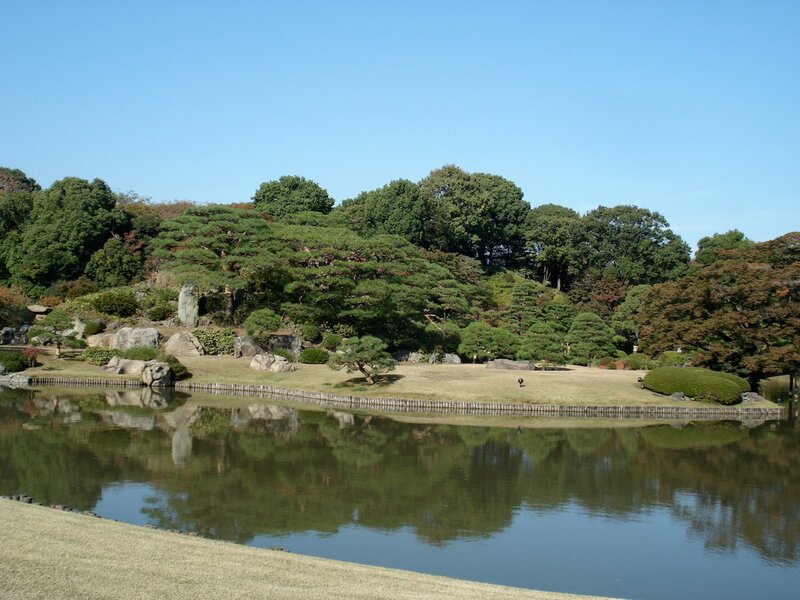 The Rikugien Gardens are not the most famous or the best Japanese garden in Tokyo. But, it is worth visiting the northern suburbs of Tokyo if you want to see a garden whose skyline is not dominated by skyscrapers. If you're looking for a challenge then try to find all 32 "Sekichu" markers (originally 88) that indicate places to where you can see the special views of the garden. The entrance to Rikugien Gardens is not particularly close to any station. The Komagome Stations on JR's Yamanote Line and Tokyo Metro's Namboku Line are both recommended and are to the north of the Rikugien Gardens. 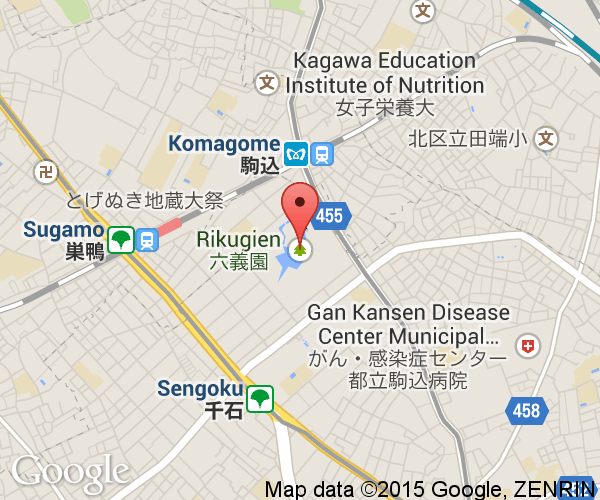 It will take around 10 minutes to reach it by walking from either of the Komagome Stations. To the south, Sengoku Station on the Toei Mita Line is a bit farther from the gardens.